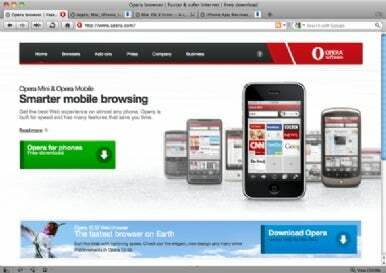 Opera Mini for iPhone: Will Apple approve it? In February, Opera released a 10.5 beta that foretold a number of enhancements and Mac-ified interface changes on the way. Now the browser maker has graduated its beta to an official shipping 10.52 version, complete with a slew of clever new features. Opera 10.52 boasts a more Mac-like interface, but this new beauty is not just skin deep. More of the browser has gone Cocoa for better integration with Mac OS X and other apps, which means it now supports Growl and multi-touch gestures. As with Safari on recent MacBooks, Opera 10.52 users can pinch-to-zoom, use two fingers to scroll, and three fingers to navigate back and forth through pages. Opera 10.52 also gained Firefox’s “Awesome Bar” feature of searching from the address bar. Other additions include customizable search engines, private browsing per window or tab, and dialog boxes that are displayed as page overlays instead of dialog boxes so you can still switch tabs or windows to do something else. Opera 10.52 for Mac is a free download that requires Mac OS X 10.4 Tiger or later on an Intel Mac.